Krabi (กระบี่) is the provincial capital of Krabi Province, Thailand. 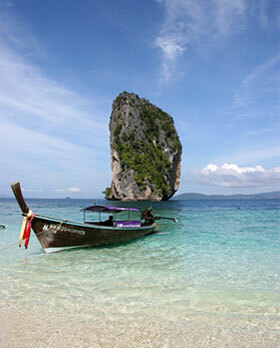 Krabi is a small city with a population of around 18,000. Located just upriver from the coast, it has no beaches and most visitors make a beeline for Had Yao, Ao Nang or Rai Leh (Railay). Nevertheless, Krabi is a relaxed place which is pleasant enough for travellers to spend a night or two and one can certainly better experience Thailand here than in Ao Nang or the other beach resorts. Krabi town, too, is far cheaper than any of the tourist resorts - this is reflected in the price of food and drinks especially. There are two night markets in Krabi town that are worth a look, also a vogue department store where real items can be found cheaper than in Ao Nang. Do check out the Tesco Lotus Shopping Mall which is near the airport. Prices are cheap and there are lots of eateries available there. An even better market can be found on Maharat Soi (Lane) 10 in the centre of town. This market has plenty of fresh fruit and lots of authentic cooked food. Only a few places have menus, otherwise point and enjoy. This market does not sell alcohol. Not to be missed is the covered morning market (the biggest in South Thailand) on Maharat Soi 7 (behind the Shell station). For early birds only. After 8am all the action is subsiding. Exactly at that time you can watch a show of national pride: the national anthem is playing and almost everyone comes to a standstill for a minute. The best place to get all kinds of fresh fruit and vegetable, khao njao (sticky rice), PatongKhoo, ChaThai (sweetened Thai-Tea) or fresh hot soymilk. The section of fresh fish and meat sellers is for hardened stomachs only. There are several Italian restaurants of varying degrees of authenticity. Viva has Italian management and probably the best food. The Hotpot Buffet Restaurant on the 2nd floor of the Tesco Lotus shopping is value for money! Pay 139 baht and eat all the crap you can stomach! Copyright © 2015 HOTELCOMPARERATE.COM All rights reserved.